Newburyport is a quaint seaside community with beautiful views of the Merrimack River and a historic, walkable downtown with 100 plus retail and restaurant businesses. There is something to offer for everyone, throughout the entire year. During winter enjoy cross-country skiing or snow shoeing at Maudslay State Park, or get cozy by the fireplace at one of our many restaurants and inns. In the spring, stroll through downtown and admire the window boxes and hanging flower baskets that fill the city, or take a birding field trip on Plum Island. In the summer you can take a harbor tour or a whale watch, sun yourself on the beaches of Plum Island, enjoy a free summer movie or stroll through our many museums. Fall is a wonderful time in Newburyport. Come to the Fall Harvest Festival, or shop downtown. Join us for the holidays, and find the perfect gift for that special someone. Anytime you visit you will find that Newburyport is a seaport for all seasons. 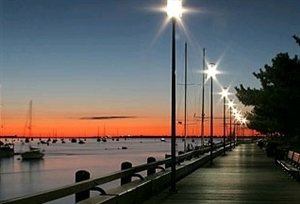 Newburyport offers year-round recreational opportunities for all ages. Try sunning on the beaches of Plum Island, cross-country skiing in winter’s snows at Maudslay State Park. Walk and hike along the beaches, through marshland and into woods. Fishing boat expeditions into the ocean and surfcasting along the shore, windsurfing, boat trips, and ocean kayaking are ways to enjoy the river and sea. Horseback riding at Maudslay, bicycling, running, jogging or walking around the flat streets, rail trail and parks of our city are popular pastimes. Spend time at a local farm picking your own fruits and flowers or stop in at the newest farmer's market. For a small city, Newburyport has an enormous wealth of visual, performing, cultural and literary art resources. Home to renowned artists, writers, performers and musicians, Newburyport offers a vast array of cultural centers and activities. From the Firehouse Center for the Performing and Visual Arts in Market Square to the Maudslay Arts Center in the 480-acre state park, and an abundance of art galleries, Newburyport offers theater, dance and musical productions, visual exhibits and literary events for all seasons. If flying into Logan International Airport, we are only 35 miles away with an estimated driving time of 48 minutes. Manchester, NH Airport is just 50 miles to our north with an estimated driving time of 58 minutes. Jan 15.6 F° 25.3 F° 34.9 F° 3.9 "
Feb 17.7 F° 27.8 F° 37.8 F° 3.3 "
Mar 26.2 F° 36.5 F° 46.7 F° 4.2 "
Apr 35.3 F° 46.4 F° 57.5 F° 4.3 "
May 45.2 F° 57.0 F° 68.8 F° 3.9 "
Jun 54.5 F° 66.2 F° 77.8 F° 3.6 "
Jul 60.8 F° 72.2 F° 83.5 F° 3.4 "
Aug 59.3 F° 70.3 F° 81.2 F° 3.5 "
Sep 50.5 F° 61.6 F° 72.8 F° 4.0 "
Oct 39.3 F° 50.6 F° 62.0 F° 4.3 "
Nov 31.5 F° 41.0 F° 50.5 F° 4.5 "
Dec 21.3 F° 30.5 F° 39.7 F° 4.1 "
Our Spring temperatures are cold with averages in the mid 40's and highs in the upper 50's. Nights are cold with lows in the mid 30's. Summer temperatures are mild with averages in the upper 60's and highs in the low 80's. Nights are cool with lows in the upper 50's. Fall temperatures are cool with averages in the low 50's and highs in the low 60's. Nights are cold with lows in the low 40's. Winter temperatures are cold with averages in the upper 20's and highs in the upper 30's. Nights are cold with lows in the upper 10's.